This year we teachers have been re-visiting our anti-bias curriculum, looking for ways to help challenge the stereotypical thinking we may see developing among the children. This is part of our teacher’s on-going training, and helps us develop strategies that support the school’s mission and philosophy. Most recently our focus has been on gender. As stated in Louise Derman-Sparks and Julie Olsen Edwards book Anti-Bias Education for Young Children and Ourselves, “While gender anatomy is universal, behaviors and attitudes considered typical and acceptable for each gender vary from culture to culture and over time.” We know from both our observations and conversations with children, that cultural messages about gender roles and limits are already in play by the time children enroll at LCP. We want every child to explore their identities fully, and to feel free to develop their capacities to make full use of our classroom environments regardless of cultural assumptions or expectations. Our discussion highlighted for all of us how important it is to be mindful of the language we are using as we engage children, and about the biases that may be present in traditional songs, rhymes and stories that are part of so many family and school cultures. Gender distinctions seem to reach into every aspect of our program. Do we really need to use the masculine forms of words, or are there easy ways to make adjustments in the words we use? Are we greeting girls with comments on their clothing or are we acknowledging their actions and feelings? Do we talk with boys about their actions and accomplishments more than we do with girls? Do we assume that it is only boys who will be unable to listen or sit still, or that boys will be less engaged than girls in discussions, books or the visual arts? What about girls who only want to wear comfortable clothes, join running and climbing games, and play roughly? Do we value developing friendships between boys and girls that are based on common interests? Can we feature both girls and boys in traditional rhymes by adding a line or two? Are there ways to talk with the children about whether it feels fair that either girls or boys are sometimes left out? How can we assure that we show every child that we value the unique qualities that make them who they are as individuals, and assure that all children are encouraged to explore the full range of intellectual activity and classroom life? We also know that as social interests grow among the children, questions come about friendship and about who can be a friend, and this can have implications related to gender. Are friends always alike? Can a boy and a girl be friends? Does a friend always do what I want them to do? Do I always need to sit near a friend or play with a friend to stay a friend? What if someone else suggests that I can’t be someone’s friend? Since questions like these have been on some children’s minds, we teachers thought about how we might incorporate conversations about friendship into conversations about gender. We’ve engaged these questions by reading many books that offer opportunities to talk about friendship, feelings between friends, and differences in temperament or play choices between friends. Books like I’m Sorry (Sam McBratney and Jennifer Eachus) and Pearl Barley and Charlie Are Friends (by Aaron Blabey) are great conversation starters for even our youngest children, and feature friendships between boys and girls. Fred Roger’s old classic Making Friends uses clear and simple language about friendship and differences between friends in a non- fiction treatment of the issues. Our discussions of these books help clarify the limits to each child’s understanding, and the impact development and life experience has on how children think about friendships. For example, when a group of our youngest girls read about a boy’s club where girls weren’t allowed, they immediately reacted with outrage about the unfairness of exclusion. But those same girls were a little less sure that it would be fair to include boys in a club for girls. Recently in each class we introduced the use of Venn diagrams (overlapping circles showing inclusive and exclusive sets) at meeting to ask basic questions and see results: What do girls like? What do boys like? By allowing children to move their ideas around the diagram we hoped conversations would lead us all to the conclusion that children, boys or girls, may like the same things or different things and that all choices are available to everyone. In each classroom, children did come to the conclusion that the things they listed were liked by children (boys and girls). But the tone of the conversation was quite different between classes. Our youngest were fairly matter of fact and quickly dropped saying boys or girls and talked about children. Children began the conversation using some common stereotypes (“Girls are quiet”; “Boys can be fire fighters”). But both boys and girls were quick to say that they too could do that other thing, or like that other thing as well, and soon everyone acknowledged that there were many things that children (not boys or girls) like to do. The Nuthatch class children, a bit older, were passionate about issues of fairness and access. Someone brought up that only boys play in blocks. 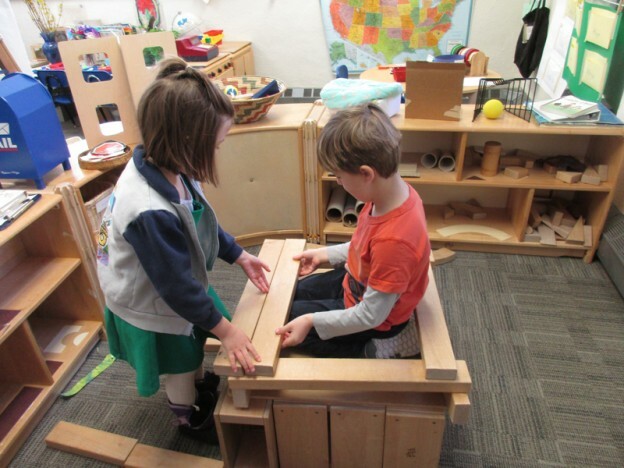 This immediately created a healthy debate as girls in the class who play in blocks said that boys only playing in blocks is not true, fair, or nice. Similarly, it was stated that only girls dance and wear dresses. Again, a great conversation was sparked from many boys saying how they love to dance and how many children in the class go to dance lessons with both boys and girls in the class. The conversation about dresses was a bit more controversial. There were a few boys who said that boys could wear dresses if they wanted to, but many boys felt strongly that they did not want to wear dresses. This created an engaged conversation about the difference between boys being able to wear dresses and boys having to wear dresses. Once some of the boys realized that even if other boys wanted to wear dresses, that would be okay as long as all boys didn’t have to wear them. Dresses then got moved to the both section. It is wonderful to see children think independently, standing up for what they believe is fair by using concrete examples that disprove one or another cultural stereotype. As the children looked at the diagram, they noticed that every idea could be done by both boys and girls. The consensus was that “boys and girls can do whatever they want to”. The Goldfinch children, our oldest preschoolers, got a bit stuck when someone mentioned that girls can have babies. (This was revisited with the clarification that it’s women, not girls, who have babies.) The boys in the Goldfinch class worked hard to come up with something they could do that girls couldn’t, but were unsuccessful. Gender issues come up all the time in the classroom, and we believe that children need to feel supported in their efforts to articulate their feelings about acceptance and exclusion, fairness, and cultural stereotypes they hear about, read about or experience. We teachers listen carefully for the meaning behind children’s words, find ways to challenge limited thinking and expand children’s sense of what’s possible. It’s an on-going process that looks different every year. This entry was posted in Curriculum, Education and tagged children, development, education, preschool on April 22, 2017 by Katrina Selawsky. Please visit our website for more information about our programs and curriculum. Additional information is available on our Facebook page, as well. 2, 3 or 5 day options. with enrichment programs and extended hours.